It is my pleasure to open the OECD’s second annual Green Investment Financing Forum – the GIFF – and to do so again with Al Gore. His presence today, speaks about the importance of this event, which is part of Climate Week Paris, a key staging post on our journey to COP21 at the end of the year. The next two days provide an opportunity to explore in detail one of the most critical challenges ahead of us: mobilising the trillions of Dollars of private investment in low-carbon, climate-resilient infrastructure needed to meet the 2-degree objective. 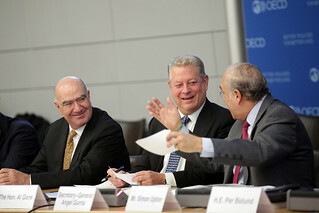 19 May 2015 - (From left) Juan José Guerra Abud, Minister of Environment and Natural Resources (SEMARTNAT) of Mexico; Al Gore, Former U.S. Vice President; and Angel Gurría, Secretary-General of the OECD at the opening the OECD Green Investment Financing Forum. Before I share some ideas on investment, let me take you back one year to our inaugural GIFF. At that time, we spoke of the importance of “core” climate policies – actions such as putting a price on carbon, and phasing out fossil fuel subsidies. These actions are still crucial. However, we can and must go further. We know that, even with increasingly stringent climate policies, we still face a whole range of obstacles in transitioning to low-carbon economies. Later today, Deputy Secretary-General Rintaro Tamaki will introduce a new report which OECD Ministers tasked us to deliver – it is called Aligning Policies for the Transition to a Low Carbon Economy, the fruit of a year of intense collaboration between the OECD, the International Energy Agency, the Nuclear Energy Agency and the International Transport Forum. The report provides a first diagnosis of “misalignments” between policy and regulatory frameworks in sectors essential to a low-carbon economy, and to climate goals. Investment is one of these critical misalignments. For example, less than 1% of the assets covered by our survey of large pension funds are allocated to direct infrastructure investment, and only a small fraction of that 1% goes to “green” infrastructure. We are also analysing the rise of hidden protectionism in clean energy in OECD and emerging economies, and will soon release a new report that discusses this issue. For example, we know that the increasing use of local content requirements can hinder investment in clean energy. We must take a much closer look at the channels and instruments available to investors if we are to unlock the trillions needed for the low-carbon transition. The “Mapping Channels” report, which we have provided as background reading, examines 70 sustainable energy deals and looks at how institutionally-held capital is mobilised. It also examines the ways in which governments can reduce risk and facilitate transactions. First, almost 40 billion Dollars of green bonds were issued in 2014. That’s almost three times the total for 2013, and we expect this number to double in 2015. Although it is growing rapidly, the market for green bonds remains a tiny fraction of the 100 trillion US Dollar global bond market. Second, direct investment in projects has surged over the last few years as institutional investors are finding opportunities to match their long-term liabilities with bankable clean energy projects. And third, listed funds, such as “YieldCos”, have raised 27 billion US Dollars in clean energy investment through a new model that didn’t exist three years ago. I am delighted that we have 23 institutional investors among us here today, and that tomorrow’s round table session will feature pension funds, insurers and fund managers who will pick up on these themes. We also need innovative and effective public finance interventions. National and multilateral development banks play a vital role. And there are also some new kids on the block: domestically-oriented green investment banks are mobilising private capital, establishing a track record, and offering distinctive models that countries can consider and adapt to their needs. Today’s meeting provides an opportunity to discuss these developments and see how even more can be done. Please be bold! This meeting is held under the Chatham House rule, so I encourage you to share what is on your mind.